Having poured scorn and not an indecent amount of bile upon the refugee deal between the Obama administration and Canberra last year, US President Donald Trump was never going to make things easy for the resettlement of various groups held on Nauru and Manus Island. Repeated emphasis has been made on the issue of how the anti-terrorism regime outlined in the USA Patriot Act disqualifies potential entrants, given the sheer scope of how “support” is defined. This is particularly applicable to the Tamils, numbering some 100, who might have been sympathetic to the cause of the Liberation Tigers of Tamil Elam. Another troubling feature of Canberra’s obstinacy lies is its inventive approach to the factual record. Both sides of the political aisle insist that the people-smuggling “market” model must be confronted, with a hammer wielded in determination against its workings. All done in the spirit of humanitarian sensibility, we are told. Yet Amnesty International has noted instances where members of the Australian navy have paid those very smugglers to move their human cargo away from Australian waters. The model, in other words, thrives under the colluding eyes of states who prefer borders and regulation over humans and rights. The tail in Canberra has continued to twist on this score. For one, where would those rejected by the US vetting process go? Even if some had passed muster under those “extreme vetting” procedures, what would it do to those with ties to Australia? Disputes have emerged. One backer for the US-Australia resettlement deal was the United Nations through its various organs dealing with refugees. But conflicting claims between the United Nations High Commissioner for Refugees, Filippo Grandi, and the Turnbull government about the resettling those captives on Manus Island and Nauru have surfaced. Grandi then gets to the crux: an explanation as to why the UNHCR, not exactly the most persuasive organisation, committed to the Australian-US agreement on resettling refugees. Canberra’s UNHCR mission was also baffled. According to Stubberfield, this understanding would prevail even of those accepted by US authorities. UN Assistant High Commissioner for Protection, Volker Turk, also added his name to the inventory of the deluded that families with ties to Australia would be prioritised. Why Grandi and the UNHCR grandees should be puzzled is itself puzzling. The official policy from Canberra on refugees has been well minted for some years. 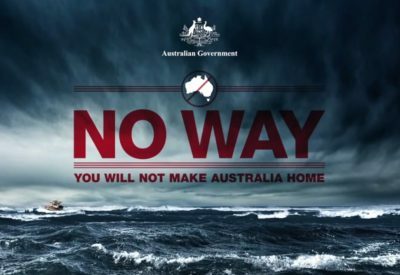 In the dying days of an election campaign, a desperate Labor prime minister, Kevin Rudd, turned over a leaf on countering naval arrivals by declaring that any unprocessed individuals heading to Australia by boat would never be permitted settlement on the mainland. A more reactionary, but consistently brutal Prime Minister Tony Abbott merely militarised the response, cloaking it with a secrecy that any authoritarian leader would be pleased with. The “never settle in Australia” approach persists with grim determination. Last week, Rudd attempted to throw a dose of humanitarianism on the policy by insisting that, when he re-commenced the offshore processing system in July 2013, he had only intended a 12-month limit on operating the Manus Island centre. Rudd remains immaculately disingenuous on this score. What we have on record is a clear case of double narratives, one spun for political convenience to an electorate hardened to Fortress Australia, and to diplomats charged with negotiating the resettlement program. Caught between two chairs, those on Manus and Nauru will fall between them, doomed to a comical and vicious solution that will see those rejected by the United States and Australia find testy homes in third, vastly inappropriate states. Featured image is from IRIN.